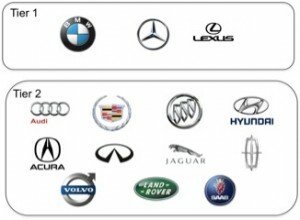 If you follow the luxury segment of the automobile business in the US, then you know that the best and most powerful brands are those considered to be “Tier 1.” They represent the largest volume brands in the segment, have the most loyal customers, command the highest margins, have the highest resale values, are the best defined, are the most prestigious and the most desirable. That said, I think the goal of becoming a Tier 1 brand may be a fool’s errand in today’s luxury segment. It made sense almost 20 years ago when Audi set that as the target but does it really make sense today? Tier 1 is full of accepted conventions that must be present in order for the brand to be truly Tier 1. For example, in the Tier 1 world, all dealerships must be exclusive and should be Taj Mahals built to reflect the prestige and loftiness of the brand they represent. In these Taj Mahal dealerships, customers must be served lattes, have a customer experience befitting their level of success and certainly not have that experience sullied by the presence of mass market product or customers. In Tier 1, as defined today, manufacturers must offer three sizes of sedans, at least two cross-overs, a sports car as well as a tuner division that churns out high performance model variants. In traditional Tier 1, it is essential to have a D-segment (think MB S-Class, BMW 7-Series, Audi A8) sedan that represents the brand’s ultimate execution of a luxury vehicle. It’s pretty rarified air up in Tier 1, but if you can get there, profits and volumes are huge.